For many decades there has really been only one recording of Pines and Fountains that matched performing quality with recorded sound, the Chicago Symphony conducted by Fritz Reiner on RCA Living Stereo, now living nicely on 3-channel and stereo Sony BMG SACD 82876716142 along with Debussy's La Mer. Countless other recordings have been made and of them only one has come close as a performance for me. In OK but unremarkable sound, and Pines only, Silvestri and the Bournemouth Symphony on BBCL4007-2. 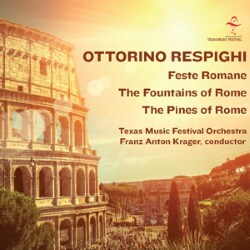 Then along comes producer and engineer John Gladney Proffitt, who, aided by a student orchestra of remarkable skill, proceeds to make a recording that at last totally outclasses that ancient 1959 effort and includes the other part of Respighi's Roman Trilogy Feste Romane, Roman Festivals. I have to put my cards on the table and say that nothing could possibly outclass the playing and interpretation of Reiner and the CSO but this festival orchestra holds its heads high and emphatically does not fail the listener: if one did not know they were students one would not guess. Franz Anton Krager, "American born and trained" it says proudly in the notes, is clearly one very fine trainer himself and has extensive national and international experience. If one wants to be picky, one could point to occasionally prosaic phrasing or slightly limp rhythms, but these are small flaws indeed, even when presented with a breathtaking level of recorded fidelity. One wonders if the old Chicago Symphony might have revealed shortcomings if recorded with this amount of clarity, though I somehow doubt Reiner would have countenanced such a result! Festivals opens with much thwacking of drums and crashing of symbols and gongs. It is easily the most vulgar piece in the trilogy and perhaps deserves its comparative neglect. Some moments in the final section are decidedly trite. But exciting and fun? It certainly is. It was the last to be written, in 1928, and does not compare with the glistening imagination shown by Respighi in the Fountains (1916) and the Pines (1924). These two masterly tone pictures conjure a series of magical and dramatic scenes full of meltingly beautiful orchestral effects, including the famous gramophone record of a nightingale. The piano plays a subtle and occasionally important role, which is revealed beautifully in this current recording. The audience at this live concert are placed firmly behind the home listener and let out great hoots of excitement at the end of each piece, especially the Pines, wisely placed last in the concert. For us at home John Proffitt has chosen to place the orchestra all around. Sometimes, for the extra brass, they are spread across the rear speakers, but all the time there is sound from beside the listener as well as in front. This puts one on a virtual rostrum along with the conductor yet without any section string leaders sounding overly close. I am guessing, but I would say the main microphones were a few metres above the orchestra to give this slightly distant spaciousness. It is very effective for domestic replay. I cannot say the same for the dynamic range which will stress all but the finest systems (as EMG used to say when awarding their 'EE' grading). I am fortunate in having a music room where levels do not matter. Those resident in apartments might want to wait for the neighbours to go out. Headphones will not do because this really needs all five channels. The stereo mix is effective (and at a markedly lower level) but it palls compared to this masterful surround rendering. Strongly recommended even if you have Reiner, Silvestri or Toscanini already. None of them sounds like this! The notes are useful, but short of all the usual timing details. The disc itself comes in a video case and has no identifying code. Access points are provided for just the beginnings of the three works. I found a screen useful to select surround or stereo and the tracks.